Our book today is one of the latest entries in the redoubtable Loeb Classical Library series, that indispensable century-old line from Harvard University Press that gives readers critically-vetted authoritative texts of Greek and Latin classics with always serviceable, often quite good English-language translations on the facing pages. The latest Loebs includes a handful of enticing goodies, but one of course commanded my attention much more than the others: the new Loeb Classical Library edition of Quintus Smyrnaeus' Posthomerica, a long verse work of Homeric fan-fiction by an author writing sometime in the second or third century. I love the Posthomerica, which tells the story so conspicuously not told by Homer: the conduct of the Trojan War after the death and funeral of Hector, tamer of horses. Most of these stories are as ancient as the material used by Homer himself; it was used and adapted and transformed by dozens of epic poets over the centuries, and by the time Quintus of Smyrna – whoever he was – took it upon himself to compose an epic poem pulling a great many strands of that material together, several of the stories had long literary histories of their own. Here we have the Amazons, led by their queen Penthesileia, coming to the aid of besieged Troy; here we have the impressive Memnon, war-chieftain of the Ethiopians, likewise coming to the aid of the Trojans (neither of these late-inning superstars has much success against the rampaging Achilles); here we have the Greeks seeking out the exiled archer Philoctetes and his Olympian bow as the key to winning the war; here we have the death of Achilles and the arrival of his son Neoptolemus to the beachhead of Troy; and here, of course, we have the Trojan Horse and the fall of Troy. These are grand stories-withing-the-story, and Quintus invariably rises to the occasion. He very intentionally pitches his poem in a Homeric tone – slightly stilted, overtly big-gesture, liberally filled with epic-style rhetorical gestures. When you read the Posthomerica in Greek, you know at once that you're not reading Homer, and you know also that you're reading Homer's biggest fan. This presents some obvious challenges for a translator. Ideally, they have to look past the big, brass Homeric notes and find the quirky minor-key grandeur that Quintus achieves in the shadow of his hero. Alan James did a fine job of it, for instance, in his 2004 The Trojan Epic, for instance, and in this new Loeb Classical edition, the translation task falls to Trinity College Director of Studies in Classics Neil Hopkinson, who makes the sound if slightly safe decision to render the Posthomerica in prose instead of verse. This is a choice with a long provenance, of course – the Penguin Classics line (which, scandalously, has never produced a paperback of Quintus) has often brought out verse classics in prose, often with impressive results. I ordinarily approach any new translation of a classic with a kind of optimistic eagerness: each translator brings a different perspective to even the most familiar material, after all, so every new English-language translation is a chance to see an old friend like Homer or Horace or Virgil through a new prism … which is not only valuable but nerdishly thrilling. The present volume replaces A. S. Way's heavily archaizing iambic pentameter translation of 1913. Quintus, like all composers of Greek epic, employed a language and poetic idiom far removed from the Greek spoken in his time and yet very familiar to his readers. English archaisms can help to produce an appropriate distancing effect, and the present translation has a tincture of these. So he spoke; and they trembled at his words just as up in the mountains young deer quake at the sound of a lion's loud roaring as they timidly flee from the beast: just so the ranks of horse-herding Trojans and their foreign allies quaked with fear at this last threatening shout of Achilles, thinking he was still unwounded. But his brave spirit and mighty limbs were weighed down by death, and he collapsed among the corpses like a huge mountain: the earth rang out under him and his armor gave an immense clattering as the noble son of Peleus fell down dead. The thud of those final cadences is a nifty rendition, capturing perfectly both Quintus' portentousness and his charming over-exertion to ape his literary hero. 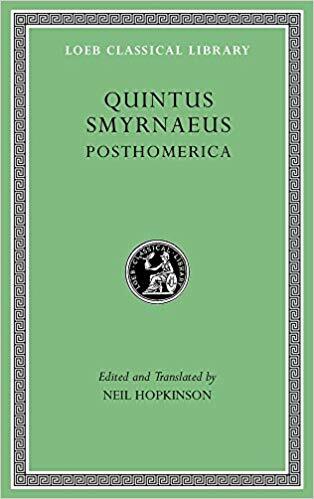 Those kinds of shrewd choices crop up all over this Hopkinson version of the Posthomerica – it's a clear, often lovely, entirely worthy translation of Quintus Smyrnaeus. It'll serve a new generation of readers and scholars admirably, and the implication of Hopkinson's opening remarks is probably just: in 2018, Way's versifying probably was a period performance in need of an update. But even so, I'm hoping some interested students track it down.